A good friend and I made a little road trip to the 2011 International Quilt Festival in Houston last weekend. We stayed with another good friend who joined us at the festival, and boy did we have a good time! Look at all these vendors. This is less than half of the booths in just the shopping part of the festival! Lots of sewing machines (including long-arm quilting machines, of course), fabric, patterns, and vintage quilts. I had a few favorite booths, but this one in particular was The Silver Needle's booth, which was the only one I saw with cross-stitch patterns. I seriously wanted to buy everything in the booth. I had to practice some major restraint. Here's a little of what I came home with. A bunch of fat quarters, some half-yard cuts, and a Weekender pattern. I've been wanting to make a Weekender bag for a while now, so it's exciting to finally have the pattern. The other half of the festival was filled with quilt exhibits. Photography wasn't allowed everywhere, but here are a few of my favorites that were allowed to be photographed. It was hard to narrow it down to three! Crested Barbet by Barbara McKie. I love the bright colors of the bird. This was so stunning in person. Vortex in Variation by Nora Ronningen. I've been a fan of optical illusions since I was a kid, so this one caught my eye right away. Isn't it amazing? I love it. Lastly, a pinwheel quilt that I forgot to note the artist on. 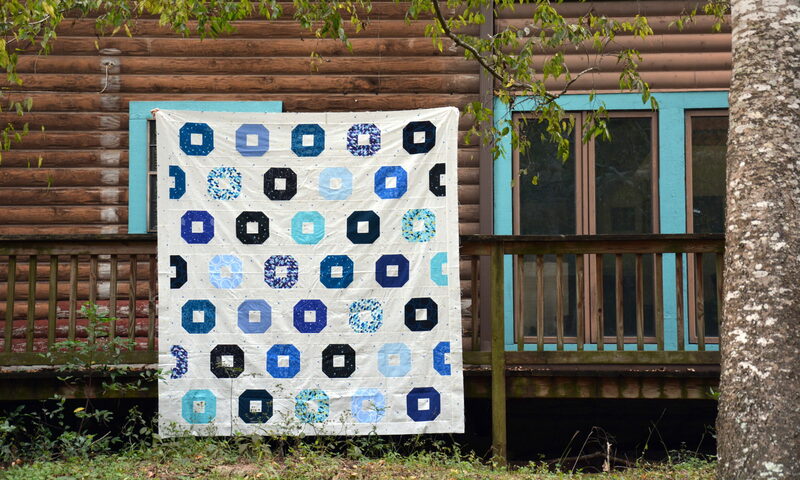 The whole quilt is pinwheels! This is a closeup of the detail. It's awesome how the colors and shapes make it look three-dimensional. And they're all pinwheels. Seriously. Love! Thanks to Amanda for letting me use her pictures. The rest of her pictures can be found here and here. I think this is going to turn into a yearly tradition!